Due to the heavy snowfall that is forecast for Thursday and Friday, the shop may not be able to open during the usual times. Please accept our sincere apologies for any inconvenience caused. 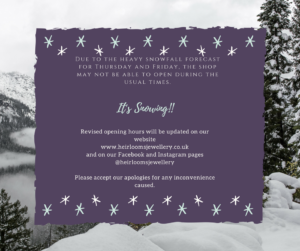 You can continue to contact us during this time via email shop@heirloomsjewellery.co.uk or by telephone on 07825710700.